PCR continues to revolutionize molecular diagnostics. Its ability to enrich genomic regions of interest for next-generation sequencing (NGS) and interface with other technologies such as mass spectrometry are helping move the field closer to the goal of personalized medicine. CHI’s recent “Next Generation Diagnostics Summit” highlighted a number of advances in R&D in this arena. FFPE samples represent one of the most abundant sources of readily available specimens from which to mine genetic information. But, they also are challenging to analyze via NGS. Elizabeth Mambo, Ph.D., senior scientist, technology development, Asuragen, reported on the company’s work to address the needs for mutation detection in such technically challenging samples. 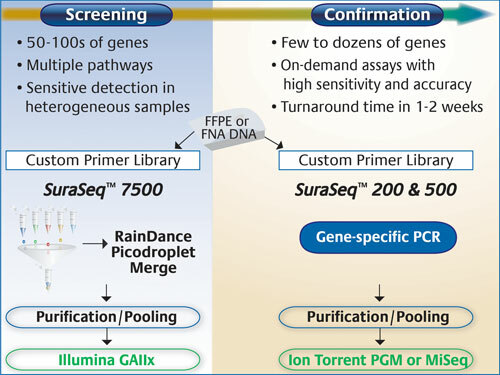 For screening purposes, the company says it utilized the RainDance RDT 1000 (RainDance Technologies), with its massively parallel picoliter droplet PCR for enrichment of up to 20,000 genomic regions, and Illumina’s Genome Analyzer that allows large-scale gene profiling or genome-wide discovery at maximal sensitivity. For more focused screening, or confirmatory purposes, they employed the Ion Torrent PGM (Life Technologies) to achieve 3–5 million reads in a 2 hour run time. The company has also recently acquired a MiSeq (Illumina) for similar studies. “It is important to use a stable of instruments that rely on different sequencing chemistries,” Dr. Latham advised. “Depending on the panel size, there can be many hits, so validating positives on an orthogonal platform provides much greater confidence in the results. The company will continue developing off-the-shelf and custom panels, as well as pursue implementation in its CLIA-certified laboratory. Asuragen’s SuraSeq 7500 panel targets >120,000 unique bases across 52 cancer genes, and captures >7,500 annotated mutations in the COSMIC database. Mutations are identified after sequencing on Illumina instruments and applying bioinformatic algorithms developed specifically to detect low-abundance variants in DNA from FFPE tumor biopsies. Mutation calls using this panel can be confirmed using on-demand custom panels, or off-the-shelf focused panels, such as SuraSeq 200 and 500, that are sequenced on either the Ion Torrent PGM or the Illumina MiSeq. Rapid identification of infectious organisms by the clinical microbiology laboratory is critical for reducing the risk of morbidity and mortality in patients. “Unfortunately, current methods primarily rely on the rather cumbersome and slow method of culturing specimens and using traditional phenotypic analysis for characterizing pathogens. First-generation molecular diagnostics provided greater speed, but could only assay for one or at best a few pathogens, meaning that diagnosticians often had to guess which pathogen to test for,” noted Garth D. Ehrlich, Ph.D., executive director, center for Genomic Sciences, Allegheny-Singer Research Institute. Dr. Ehrlich says a new method coupling PCR and mass spectrometry could revolutionize the way clinical labs identify pathogens. “We have begun using a PCR-based mass spectrometry method known as PCR-electron spray ionization, time-of-flight, mass spectrometry (PCR-ESI-TOF-MS). This technology provides unparalleled sensitivity, accuracy, and breadth within the realm of molecular diagnostics for pathogen detection. It takes advantage of the exquisite sensitivity of both PCR and mass spectrometry. The instrument used by Dr. Ehrlich and colleagues is Abbott Laboratories’ Ibis T-5000 system, predecessor to the current PLEX-ID platform that is being commercialized for clinical diagnostics. He says one doesn’t have to initially guess which pathogen(s) might be causing an infection; rather the system is capable of a broad-based identification of bacteria and fungi. His studies have evaluated samples from numerous infectious and inflammatory conditions including total joint failures, osteoarthritis, chronic nonhealing wounds, and surgical site infections, among others. “The system can semiquantitatively identify mixed populations of microbes with a readout of genotypic analysis. There are so many advantages of this PCR-mass spec system over the rather archaic method of culturing a sample. To provide a more comprehensive genetic analysis of patient tumor tissues requires a technology that is not only suitable for assessing multiple genes but also sensitive enough to do so using minimal amounts of sample. Jin Li, M.D., Ph.D., research director, advanced diagnostics, MolecularMD, reported on the company’s studies cross validating two commercial NGS cancer panels: Ion Torrent AmpliSeq and Illumina TruSeq. MolecularMD is a privately owned molecular diagnostics company that develops and provides assays for clinical development of targeted cancer therapy. Companion diagnostics are assays that evaluate proteins or genes in order to stratify a patient population to better determine who will respond most favorably (or at all) to a therapeutic. “This is more an FDA regulatory term since some companies are now required to provide a companion diagnostic whenever they are approved for a therapeutic. The idea is to improve patient treatment by stratifying patients into responder or nonresponder populations,” noted Richard Montagna, Ph.D., senior vp, business development, Rheonix. Dr. Montagna said the challenge for companies is to determine when to invest the time and effort to develop the companion diagnostic for the corresponding therapeutic. In the meantime, Rheonix has developed a fully automated platform for companion diagnostics called the Rheonix CARD® system that processes a range of clinical specimens. The system is also suitable for buccal swabs, whole blood, fresh tissue, and FFPE samples. Each can be placed into the system for automatic, unattended cell lysis, DNA extraction and purification, PCR-based amplification of targets, and detection of amplicons on an integrated DNA microarray. The company will perform its first clinical study at four sites by year-end. “We have developed a Rheonix Warfarin assay for warfarin sensitivity. Patients are given warfarin to reduce the chance of stroke-causing blood clots. Rheonix also has programs using the CARD technology to detect the presence of single nucleotide polymorphisms associated with Plavix sensitivity and KRAS markers, among others. Clearly, the arena of molecular diagnostics is a field on the move. Modifying and integrating technologies such as PCR-based target enrichment, NGS, and mass spectrometry are leading candidates for new synergistic approaches. 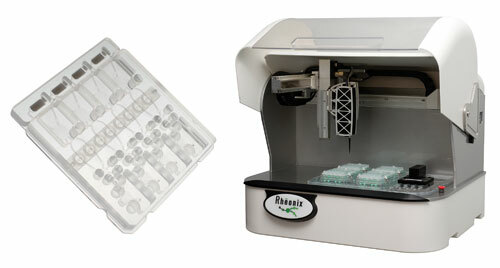 Once up to six disposable plastic Rheonix CARD (left) devices, each capable of analyzing four samples, are inserted into the EncompassMDx Workstation (right), all sample preparation, analysis, and readout of results are automatically performed.